A very adventurous and exciting story, filled with enough action to make even the most stubborn of readers get engaged. I know the teens are gonna love this. Because this is the second book in the Riders duology, I don’t want to say anything spoilery. But what I can tell you is that this has to be one of favorite true YA series. My kids and I read the first book, Riders, right when it came out. Then I just did a relisten last week, with them listening every now and then, and all the excitement came back to me. In fact, my non reader son actually found ways to be in the same room as me so he could listen to the book, but not making it obvious that he was listening. The audible was very addicting. I found myself actually doing chores just so I could listen to it more. That, my friends, is a sign of a good book. And my anti romance daughter was equally intrigued with this story as well. I’m always on the lookout for exciting YA books that aren’t completely centered around romance, and this one fit the bill as well. It enough to keep us both happy, and that’s a rarity. Well, enough about Riders, now onto Seeker. 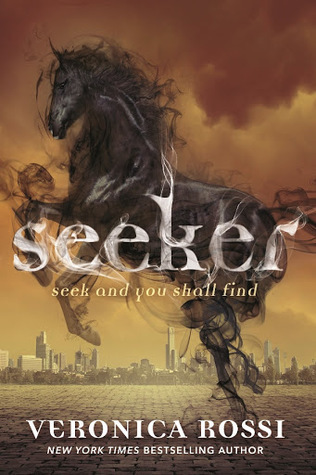 Seeker takes place about 8 months after Riders end. The characters are trying to work past what happened and try to find a solution. Since they’re younger and less mature, they don’t always make the right decisions. They try and do things on their own, so save others from harm, but what they really need to do is work together. Once they realize this, then things start to fall into place. I’m not saying that nothing bad will happen, but it’s easier to deal with the bad, when you have your friends and family close by. It’s very bittersweet to have this book end. I will miss these characters and I wish there were more books coming, but alas, there is not. But I am happy to see their trials complete and them still together and moving on as a family. This series will be added to my master list of YA books and I have a feeling it will be recommended often.